Today the Supreme Court held an investiture ceremony for Justice Brett Kavanaugh. 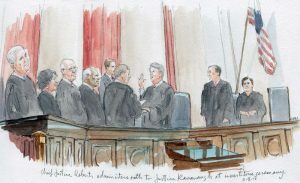 Kavanaugh took the oath of office on October 6, shortly after he was confirmed, and he began to participate in the Supreme Court’s cases two days later, so this morning’s six-minute ceremony is largely a formality, at which the court will officially receive Kavanaugh’s commission; the ceremony, which is followed by a reception, also gives Kavanaugh a chance to celebrate with his family, friends and colleagues. 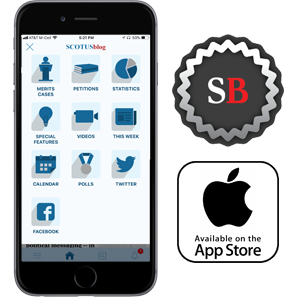 It hasn’t been that long – less than 18 months – since the court held an investiture ceremony for Justice Neil Gorsuch, so many of the details are familiar to the press corps. We are ushered to our seats in the press section roughly 40 minutes before the ceremony begins, giving us plenty of time to gossip and crane our necks to try to spot the notables in the audience. Many (if not all) of the judges of the U.S. Court of Appeals for the District of Columbia Circuit, where Kavanaugh was a judge until recently, are in attendance, sitting in the front row of the public section. The group includes Merrick Garland, who was nominated in 2016 by President Barack Obama to fill the seat that Gorsuch now holds. Sitting several rows ahead of Garland is Mitch McConnell, the Senate majority leader, who famously refused to hold a hearing for Garland. McConnell is accompanied by his wife, Elaine Chao, the Secretary of Transportation. Senator Lindsay Graham, a staunch defender of Kavanaugh during Kavanaugh’s Senate confirmation hearings, is also in attendance, as is former White House counsel Don McGahn. Shortly before the ceremony begins, White House press secretary Sarah Sanders is escorted to one of the seats normally reserved for lawyers. Sanders, whose relationship with the press has sometimes been contentious, does not follow the example set by her predecessor, Sean Spicer, who sat with reporters in the press section during the Gorsuch investiture. The next entrants on to the stage are President Donald Trump and his wife, Melania. They are seated in the front row of the seats perpendicular to the bench, normally reserved for the justices’ guests, next to retired Justice Anthony Kennedy, whom Kavanaugh succeeds. Justice John Paul Stevens, who is 98 years old, attended the Gorsuch investiture but is not here today. 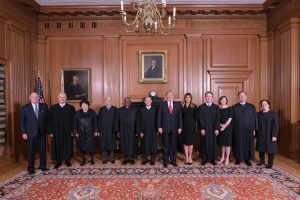 The justices themselves then take the bench, but there is a notable absence. Shortly before we came upstairs, the Public Information Office issued a press release announcing that 85-year-old Justice Ruth Bader Ginsburg has been admitted to George Washington University Hospital for “observation and treatment” after falling last night in her office at the court. She has, the court tells us, three broken ribs. 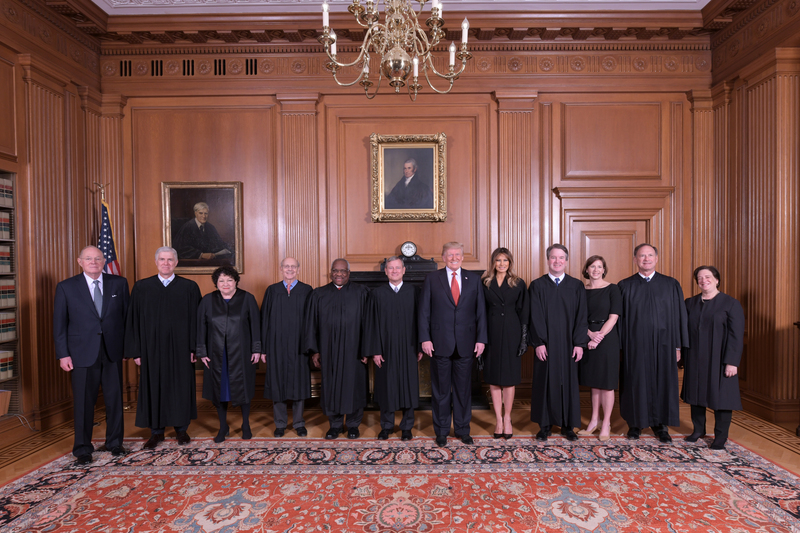 Chief Justice John Roberts welcomes the president and first lady, along with Kennedy. 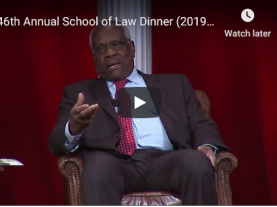 He does not mention Ginsburg’s absence. The next part of the ceremony draws more interest than we would have expected a few days ago. 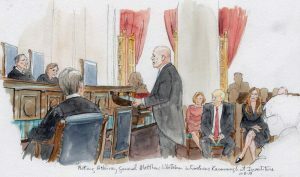 Matthew Whitaker, whom the president named as acting attorney general yesterday in the wake of Jeff Sessions’ resignation, rises to present Kavanaugh’s commission – the piece of paper formally appointing him to the court – to the justices. Like Deputy Attorney General Rod Rosenstein, who is seated with Whitaker at the table usually designated for lawyers who are arguing at the court, Whitaker is dressed in a formal morning coat, and when he presents the commission his voice is very different from Sessions’ southern drawl. Scott Harris, the clerk of the Supreme Court, then reads Kavanaugh’s commission aloud. Notably, although it was presented to the court by Whitaker, it was signed before yesterday, by the president and Sessions. With the ceremony nearing the end, Kavanaugh ascends to the bench to take the judicial oath. 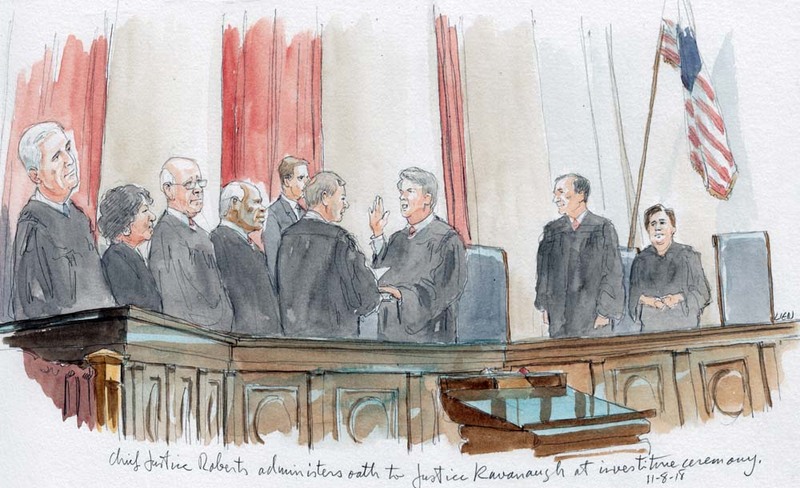 On his way to the middle of the bench, where the chief justice is waiting, Kavanaugh passes Gorsuch and Justices Sonia Sotomayor, Stephen Breyer and Clarence Thomas and shakes hands with them. After taking the oath, Kavanaugh then moves toward his seat on the far opposite end of the bench, shaking hands with Justices Samuel Alito and Elena Kagan along the way. After Roberts issues a “warm welcome” to Kavanaugh, the ceremony is over – although a reception, to which the press corps is not invited, will likely go on for far longer than the six-minute ceremony.